Big players make big plays, and twice Russell Wilson made huge plays that first kept the Seahawks in the contest and then won them it. His ability to connect with precision on deep balls to David Moore and Tyler Lockett was the deciding factor in this game, as Wilson looks more and more comfortable behind a line you can almost feel the trust being rebuilt in. They might not be the most heralded group of receivers in the league, but the ability of the aforementioned Moore and Lockett to make key plays is a testament to an underrated group that won their matchups with the Panthers cornerback groups. Moore was especially impressive given how rarely he was targeted, but he maximized his opportunities first with an ankle-breaking double move and then with a game-changing touchdown grab. This isn’t the Seahawks defense you remember dominating teams, but that’s not to say that some of the new faces don’t have talent. Second-year pro Nazair Jones hasn’t consistently shown it this year, but he had one of his best games on Sunday. Nothing highlighted this more than a first-quarter tackle for a loss where he destroyed Trai Turner to bring the field goal unit onto the field. After a strong start to the year, Bradley McDougald‘s play is reverting to a more expected level, but he showed he’s no flash in the pan with a good outing. Nothing quite highlighted this like his fantastic red-zone interception that took points off the board for the Panthers. By his high standards, this is something of a down year for Kawann Short. But he remains one of the most talented defensive tackles in the league and put together a strong game against the run and the pass, including one breathtakingly explosive bull rush that walked Justin Britt into Wilson late in the fourth. It was a bad day for the secondary with Captain Munnerlyn and Corn Elder both routinely beaten by the Seahawks receivers. Elder, in particular, looked every bit the inexperienced player he is, as he entered the game with just 117 career regular season snaps. It was a monster day for Christian McCaffrey in the fantasy world but a mixed day in the real one. Sometimes the football Gods shine on you, and today was definitely that day. While McCaffrey did make a number of big highlight reel runs, he did also put the ball on the ground two times (one that was incorrectly ruled down on the field and another where Greg Olsen recovered a goalline fumble). The stat sheet won’t record the turnover opportunities he presented the Seahawks, but it was a black mark on an otherwise good day. Cam Newton will look back to one throw that allowed McDougald to make a tremendous play and think without that the Panthers probably halted their losing streak. His connection with D.J. Moore just gets better each week and bodes extremely well for the future, especially with a versatile weapon like McCaffrey running routes. Strong red-zone defense at key times and big plays throwing downfield ensured that while Carolina always felt in control, they were never able to pull away. 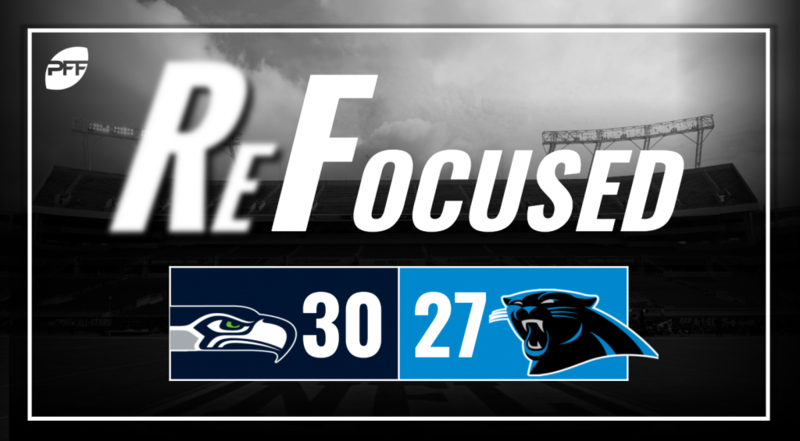 The Panthers couldn’t turn chain moving drives into touchdowns, as the team settled early for field goals (and later threw one pick) when they had the Seahawks on the ropes.